When you have a lot of projects around the house that involve woodworking and rough-cutting construction, etc. a jigsaw is a must have as it is ideal for beveled, curved, and straight cuts – cuts that are difficult to do by hand the jigsaw does effortlessly like cutting square holes into a panel, etc. There are so many brands of jigsaws to sort through that have various features for people’s individual needs. We have created a list of the best jigsaw brands and listed the pros and cons followed by a handy jigsaw buyer’s guide to help you find that perfect addition to your tool arsenal. 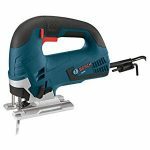 Here is the Bosch 7-Amp Top-handle Jigsaw features a constant response circuitry for accurate and more consistent results. The low-vibration design for smooth cutting up to 5-7/8″ on wood and 3/8″ on steel. This jigsaw delivers a variable speed setting of up to 3,100 SPM with a 4-position orbital operation for different blade strokes. We also like tool-less blade change and the onboard storage system to store the bevel wrench. In my opinion, Bosch makes the best jigsaw on today’s market. Q – Can the saw accept the U-shaped blades? A – No it will not. Q – Will it include a carrying case of some sort? A – Yes! A really good hard case. Q – Need to cut a 4-inch radius in a pine 2 x 6. Can this saw do it without the blade deflecting? A – Using long enough narrow blades and the proper orbital action setting you should be able to cut as tight of a radius as 2″ at over 2″. 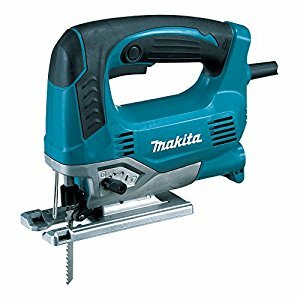 Here is the Makita 6.5 Amp Top-Handle Jigsaw that is perfect for cutting an entire range of materials with ease and accuracy. The jigsaw combines the performance and power with the variable speed control dial so that you can match the application to the speed. We dig the reduced vibration this tool has with the counterbalance system which increases the control and comfort. It is lightweight and sturdy designed to reduce user fatigue no matter how demanding the task at hand is perfect for DIY projects and job sites. Q – Is it possible to cut 2″ wood with a longer blade? A – Yes! But keep in mind that the greater the size the wood you’re cutting, the slower you will need to travel. Trying to cut at a faster speed will cause the blade to overheat due to the increased friction, and may increase the chances of blade breakage. I would suggest using a high-quality blade and move the saw at a little bit slower speed to avoid overheating the blade. Q – Does it come with a blade? A – Yes. One blade is included. Q – Will this jigsaw accept U-Shank Blades? A – No. Only T-Shank blades. Q – Does it have a LED light? 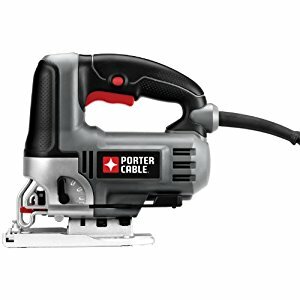 Here is the PORTER CABLE 6.0 A Orbital Jigsaw that is perfect for cutting sink cutouts, art projects, plywood, scrollwork, and shelving, etc. 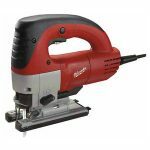 Ideal for cutting designs into dimensional lumber and this model includes an easy tool-free bevel adjustment of 0, 15, 30, and 45-degrees and also has four orbital settings letting you adjust the cutting performance to the material. Includes a shoe cover that will protect the shoe when not in operation and protect the softer surfaces while cutting. Q – Is there a case included? Q – Can this jigsaw cut through 1 1/2″ plywood? A – Yes. I cut through 2 x 4 stock (which is 1 1/2″ thick) many years ago with a jigsaw that had less power and lightweight. Just go slowly, use a sharp blade, and let the saw do the work without forcing the cut and you should do fine. Q – Does it include a front blower to keep the workspace clear of debris when cutting? A – No it doesn’t but the jigsaw cuts clean and easy so it will not be an issue. Q – Is there a rip fence? Here is the Milwaukee 6268-21 orbital jigsaw that delivers the ultimate in precision and accuracy along with versatility and ergonomics. The powerful 6.5-amp motor offers 1-inch-stroke with 3,000-strokes per minute, tachometer feedback plus a 4-position orbital cutting that will get the job done faster in the toughest of materials. We like the cushioned grip handle with the counter balance mechanism that reduces vibration to give optimal user comfort and support. Q – Does it come with a case? Q – Will the blade get ejected or does it need to be manually removed? A – Removed manually by rotating the chuck. Q – Is it a variable speed control? A – Yes, trigger controlled by the user. Q – Is this the best jigsaw out there? A – No, but it’s a good jigsaw that can take a beating. 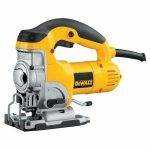 Here is the Dewalt DW331K 6.5 Amp Top-Handle Jigsaw that quickly cuts through materials such as thin gauge metals, fiberglass, plastics, and hardwoods. It includes a 4-position orbital operation where you can opt for aggressive or more smooth cutting based on applications. It has a variable speed of 3100 SPM for the ultimate cutting experience. We like the Adjustable shoe for cutting stability for greater precision. A couple issues of the blade not staying in. Q – What type of shank blade does it use? Q – Is the rip guide included? Q – Does this saw come with a trigger lock – to keep the trigger engaged while taking my finger off it on long cuts? A – Yes. Above the trigger and on the left side of the trigger on the handle. Q – Is there a fan and a LED light? A – It has the fan but no light. Here is the Bosch JSH180 18V Li-Ion Jigsaw that is both cordless and lightweight for the ultimate portability and user comfort. About 30% lighter and 10% more compact than the leading competitors. The one-handed blade change makes for easier and faster insertion and ejection with a grip size smaller than the competitors by about 15%. We like the Smallest grip diameter because it reduces user fatigue during extended use applications. Q – Does it come with the battery and charger? A – No. It’s a bare tool so the battery and charger need to be bought separately. Q – Does it include a case? A – No, bare tool. Q – What are the dimensions of the jigsaw? 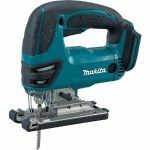 Q – Is this the best cordless jigsaw? A- It’s certainly ranked up there as a great cordless jigsaw. Here is the Makita XVJ03Z 18-Volt LXT Lithium-Ion Cordless Jigsaw that combines power and precision with reduced user fatigue weighing in at just 6.1 pounds of compact power. The jigsaw comes with less noise and reduced vibration for comfort and control. We like the fact that the Makita battery has the fastest charging time than other leading competitors reducing production downtime. Q – Will it cut 2×4? A – If you’re using a long enough blade that it is at least 2″. Q – Can I use my Milwaukee M18 Battery pack? 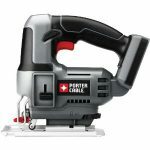 Here is the Porter-Cable PC18JS 18-volt cordless jigsaw that is powered and ready for the ultimate in cutting action at your fingertips – just keep those fingers from the blade. It includes many helpful features such as a vacuum attachment port for easy dust and debris cleanup reducing airborne dust, as well. The jigsaw’s tool-free blade is easy to change without touching any hot blades. We like the three-position orbital control that alters the blade angle which adds more flexibility for a wide array of cutting situations for smoother and faster cutting based on the application at hand. In addition to all of that greatness, this beast has the trigger initiated variable speed for quick and consistent cutting. Q – Can this tool work with both NiCd and the lithium batteries? A – Yes. Just as long as they’re 18v. Q – U-Shank or T-Shank? A – U-Shank is accepted some have reported using both blade types, though. Q – Does it include a hard case, battery or charger? A – It’s a bare tool so only the jigsaw is included. 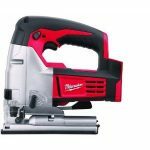 Here is the Milwaukee M18 Cordless Lithium-ion Jigsaw that is packed with features to deliver only the most accuracy and ease of use. The tool includes a 5-position orbital setting for the top cutting versatility for many of your job applications. The tool-free shoe bevel will deliver fast and accurate shoe adjustments while the QUIK-LOK blade clamp will assist in the easy and fast blade changes. Q – Does it come with a LED light? Q – Will the toll include any blades? A – No, the blades are sold separately. Q – What type of blade does it accept? 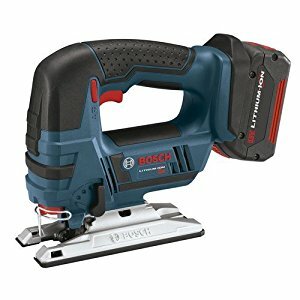 Q – Is it a brushless tool? A – No, uses a brushed motor. 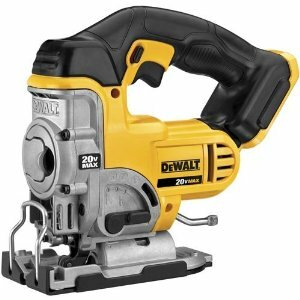 Here is the DEWALT 20-Volt Max Lithium-Ion Cordless Jig Saw that is perfect for installing and cutting a wide variety of materials. The all-metal lever-action keyless blade change that gives the user fast and easy blade changes that will increase production reducing downtime. The variable speed control is 0-3,000 SPM range that is trigger initiated that allows you to match the material to the speed for the best results. Q – Is there a carrying case with this tool? Q – Is there a battery or charger? A – It’s a bare tool so the battery and charger are sold separately. Q- Does Dewalt make the best jigsaw out there today? A- I would rank it in the top 3. When you have a jigsaw tool in your life, you can pretty much cut any direction you want igniting much more creativity with the craft projects due to the movement freedom in entails. The jigsaw buyer’s guide below will offer you highlights on various uses that come with a jigsaw tool along with the performance options, power, and with cutting tips thrown into the mix. When the projects you’re working on need the most power that a jigsaw can deliver, a corded tool is the best option, and you will want to look at different features and handles to make your craft cuts more accurate with the ultimate precision. Corded Jigsaws: The can come in a range 3 to 8-amps with 5 or more amps delivering optimal power for the heavy-duty use. They will also be much more lightweight and easier to the user to use without the added battery weight causing fatigue. The Dual-Bevel: This capability provides the angled cuts in either direction without the operator flipping the work-piece. Anti-Vibration: This feature will reduce wear on the hands and improve precision. Dust Collection Port: The ports will clean sawdust while you’re working and the dust blowers will clear away all of the sawdust so the visibility is available so that you can see the cut line more easily. Built-in LED Lights: An added convenience to improve visibility without the need for work lights. Barrel-grip or D-style Handles: These deliver added comfort, plus cushion-comfort grips for all day use without discomfort. Quick-change Blades: Will provide the operator with quick blade replacement, often without the use of tools known as “tool-less” blade change. Knob-style Auxiliary Handle: This feature is for precision steering control ideal for scroll or craft cuts. 360-degree Rotating Blades: Is a feature designed for accurate scroll or craft cuts. Orbital action: This feature uses a back and forth motion and also up and down movements for quicker, more aggressive cuts. Depending on the blade your jigsaw is using such as reverse tooth blade or a standard the techniques will vary and safety precautions are highly important when you’re cutting metal. Standard: The blade will cut upstroke, so the saw stays tightly against the material to reduce the vibration for user comfort. The tear out will happen on top of cut which means you’ll want to good side of the material facing downward for the ultimate clean cut. Reverse-Tooth Blade: With this cutting action it will be downstroke where you will want the best side of the material facing upward and have the orbiting action turned off. Keep in mind that downward pressure will need to be supplied to the saw to reduce its tendency to jump. Eye Protection: When you’re cutting with a tough material like metal you’ll need eye protection. If the jigsaw you’re using is equipped with a dust blower shutting it off will reduce and control the sharp chips from flying airborne. Turning off the orbital action will also reduce risks to the eye if not wearing protection. Here are a list of common features most jigsaws will have to get the most benefits of your work.